cream silk hair fall defense giveaway! Hi Guys! 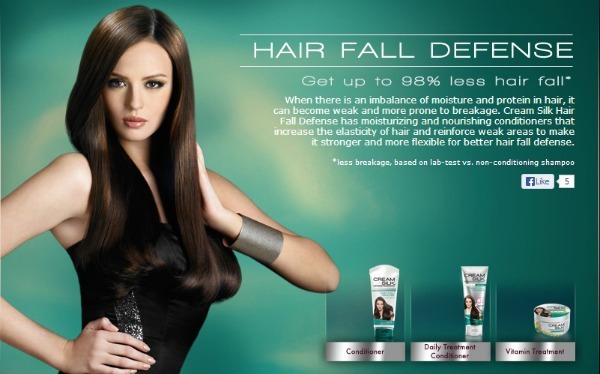 Have you heard about Cream Silk's new Hair Fall Defense line? It has Vita-Boost complex which not only makes your hair 10x stronger, it also penetrates hair deep inside to smoothen and make your hair strands shine. If you think it ends there, think again! Cream Silk's newest tvc with Sam Pinto shows us how the Hair Fall Defense System not only makes you see strong hair, but actually hear it, too!!! Yes, hear it! 1. Like Cream Silk on Facebook and on Twitter. 2. Follow me on GFC (Google Friend Connect). 4. Leave a comment on this post with your name, email adress and share URL. Creamsilk has been my hair's best friend since 2000. :) Hoping I could win this giveaway.